Agriculture Secretary Sonny Perdue (right) & Interior Secretary Ryan Zinke signed a memorandum to wildland fire leadership. 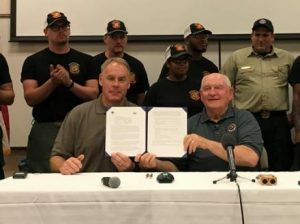 “The Departments of the Interior and Agriculture will improve the way that both Agencies manage wildfires by ensuring that all of our firefighting assets are utilized in the most efficient way possible. It is critical that firefighters have the right tools, resources, and flexibility to allow them to do their jobs safely and effectively. We look forward to working with leaders in both Agencies along with our state and local partners to explore opportunities to improve our operational efficiency and take advantage of the firefighting infrastructure and assets that are currently in place. We will also continue to integrate science and technology into all of our firefighting and to capitalize on other advancements to better inform and support our firefighting capabilities. To read the memorandum from Secretaries Perdue and Zinke in its entirety, please view the USDA and DOI 2017 Direction to Wildland Fire Leadership Memorandum (PDF, 64.7 KB).